A balance transfer credit card is a great option for those of us looking to consolidate debt in 2019 and move closer to financial freedom. Balance transfer credit cards simply allow you to transfer your debt from a high-interest credit card to one with a lower interest rate, sometimes 0% for up to a year. When is a Balance Transfer the Right Option? Balance transfers are a good idea for someone that has a reasonable amount of credit card debt on a high-interest credit card. The majority of reputable balance transfer credit cards require that the applicant have good to excellent credit (around 690 – 850). This isn’t a great debt consolidation option for someone hoping to repair their credit. Your existing credit card issuer will first need to approve all or part of the balance transfer request. It can take up to 3 – 5 weeks for a balance transfer to take effect, so you will need to continue making payments on your old account until the transfer has been completed. Balance Transfer Fees: Balance transfer fees are typically 3% to 5% of the transfer amount. 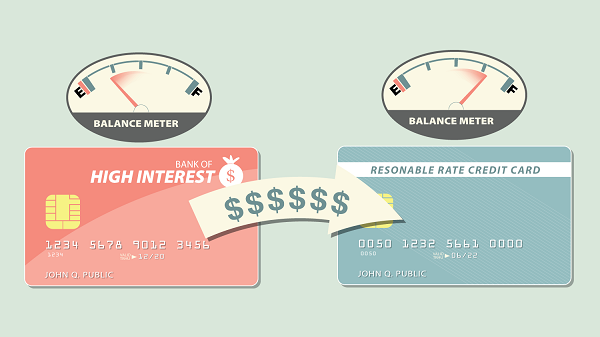 Interest Rates: Most balance transfer credit cards offer a 0% APR introductory rate; however, interest rates apply after this introductory period, just as they would for any other credit card. Annual Fees: Ideally, a balance transfer card won’t include annual fees; however, a few do. It is important to be aware of this when looking for cards. The criteria above are highlighted for each of the cards we’ve identified in this post. Balance Transfer Fee: 3% of the amount transferred, with a minimum of $10. Introductory APR: 0% on purchases for 15 months. Rewards: Access to FICO score for free once per month. Pros: No annual fee and a great introductory offer – $0 balance transfer fee on transfers made within the first 60 days of opening an account. If you are able to pay down your debt quickly, you may not incur any interest or pay any fees. Cons: Comparatively high balance transfer fee after the introductory period, and a comparatively shorter introductory APR period. There are also no additional rewards associated with this card. Rewards: No rewards, but cardholders can check their FICO score once a month for free. Pros: No annual fee and a great introductory offer – $0 balance transfer fee on transfers made within the first 60 days of opening an account. This card is also available to those with average credit, compared to the rest of the cards on this list, which require excellent credit. Cons: No rewards, and account holders can’t transfer balances from other Chase credit cards or non-credit-card debt. Transfers can’t exceed $15,000 in total, so this card isn’t a good option for someone with relatively high credit card debt. It also has a comparatively short introductory APR period. Balance Transfer Fee: 3% of the amount transferred, with a minimum of $5. Introductory APR: 0% on purchases for 21 months. Pros: No annual fees, no late fees, and an extremely long introductory APR offer. This card is ideal for someone that needs a little longer to pay down their debt. Citi also allows you to transfer any type of debt to your card, including non-credit-card debt such as student loans and auto loans. Cons: No rewards, and account holders can’t transfer balances from other Citi credit cards. Pros: No annual fee, and a comparatively long 21-month introductory period. This is an excellent card for someone that needs longer to pay back their debt. Balance Transfer Fee: 0% on balance transfers for 18 months. Introductory APR: 0% on purchases for 6 months. Rewards: Earn 5% cash back at gas stations, grocery stores, Amazon.com, or wholesale clubs each quarter. Cash back can be redeemed at any time, it never expires. Pros: This is the only balance transfer card on this list that offers robust cash back rewards, so it is worth holding onto long after your debt has been paid off. If you have good to excellent credit and are able to pay down your debt quickly, this card is an excellent option. There are also new-cardholder bonuses that grow the more often you use your card for everyday purchases. The 18 month 0% balance transfer fee period isn’t as long as the two 21-month options offered through Citi, but it still stacks up nicely against introductory offers from other balance transfer credit cards. Cons: Comparatively short introductory period. Unless you can pay your debt off within six months, you will likely incur interest charges with this card. The Discover it MasterCard is by far the best long-term value. It is the only card that offers rewards on everyday purchases, and its 18-month 0% transfer charge is a strong introductory offer. For those that may need longer to pay off their debt that also has the bulk of their debt in student loans or an auto loan, the Citi Simplicity card is the best option. This entry was posted in Balance Transfer Cards, Credit Cards, Debt, Discover, Personal Finance, Slate and tagged balance transfer credit cards. Bookmark the permalink.